Our travels are revealing Evan as mostly a big boy now. He rides well in the car aside from the occasional protest over Matt's song selection. He loves meeting and playing with other kids and displays hardly any shyness with our adult friends and family. While it's still best for him to take a nap each day, he can do without when we need some flex in our schedules and has been sleeping on pallets on the floor as well as twin beds. Most recently, he shared a queen bed for three nights with Tobin in our hotel in Missouri. As it's worked out on this trip, we've put Tobin and him to bed at the same time each night, instead of staggering his slightly earlier. Evan's been brave about swimming and boating, activities he's seldom done up until this summer. 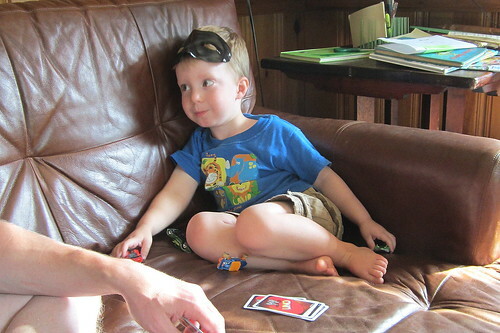 He's even trying his hand at playing Uno these days. And he's great about using the potty, finally telling us when he needs to go--instead of just holding it until we took him for a potty break. On the way home from Missouri, he insisted in his very forceful way, "I need to tee tee in the grass!" We chuckled and dismissed him as being silly and dramatic at first. But he persisted, so we exited the interstate and let him pee in a gas station toilet--not the grass--and Matt reported that he in fact had been holding quite a bit. Evan is still enough a baby that he insists on Dad at nap and bedtime. We also tend to watch him closely around other kids, especially younger ones like Lauren, as he displays more aggression than Tobin ever has. And he doesn't really eat anything in significant amounts except for waffles, pizza and ice cream. Oh, and chips. He'll "ask" for chips by yelling "I need chips!" Tonight, he insisted "I need lemonade! Right now!" when offered his usual water before bedtime. All this to say, he's still just three and learning about regulating his big emotions. We just try to keep a straight face while we help him understand that he can't have everything he wants right now! This summer, Evan's been interested at each of our stops along the way in hanging out with someone other than his parents. Whether Uncle "Don," Sarah Beth, Uncle Dan, Jacob or, most poignantly lately, Nana, Evan has been insistent on knowing where his favorite person of the moment is at all times. Fielding the "Where's Nana?" question has been hard, and he's sweetly offered possible answers like "Nana's at her house?" or "Nana's at the doctor?" When we told him she was in Heaven, at first he misheard us and asked, "She's at Evan's house?" As I tried to enunciate the distinction, he finally settled on Nana being in "Heaven's house." Like Tobin, he was very interested in looking at the pictures we were going through to display at the funeral. Grandma showed him a picture of Nana and her husband Papa and told Evan they were her mama and daddy. Several minutes later he saw another picture of Papa, who passed away in 2005, and asked Grandma, "Is that your dad?" As he was snuggling with me before heading to bed, he asked, "Where's Nana and Papa?" I told him they were both in Heaven, touched that he so quickly associated Papa with Nana, as we'd probably never really showed him pictures of him before that night. 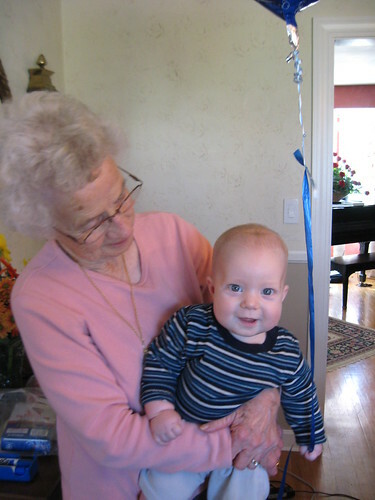 Nana and Ev were good buddies. She visited Louisville each Thanksgiving and Christmas in recent years and then moved permanently to Kentucky in 2010, so Evan got to see her on almost all his visits to Grandma's house. 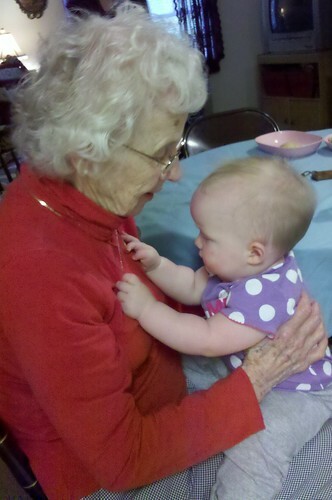 I love this picture of Nana holding five-month-old Evan. As I recall, I remember us encouraging her to be sure to sit down when she held him because he was pushing 20 pounds and she was 87 at the time. But she was so playful and active that she'd end up carrying him around like this, both of them obviously enjoying it quite a bit. 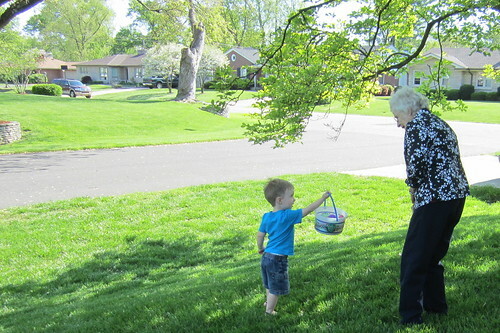 And then this picture is from our last visit with Nana this past Easter. Evan was so excited to show her the eggs he'd found. There are three videos in the set, but here's the best as it displays the range of emotions so typical of our baby boy right now. Enjoy! As my road-weary dearth of posts continues, I wanted to recognize our best traveler of all (including Matt and myself). Even with the exciting experiences available to him, nearly every day at some point, Tobin curls up with a book, quietly reading to himself. Of course, he's done so in the car too. 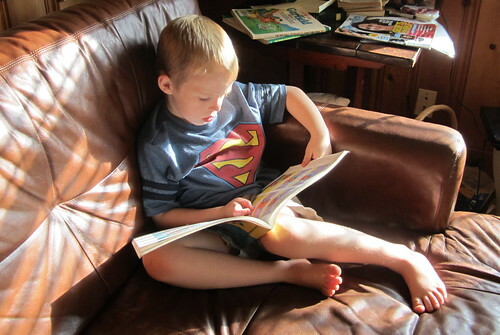 But we'd also spot him tucked away on a couch in the main cottage in Wisconsin or, as seen here, in Grandma's den enjoying a little solo time, nose in book. In Kentucky, he's discovered Garfield, which is a fun trip down memory lane for us and quite amusing for him. During our extended stay in Kentucky, he's encouraged the adults around him to take breaks from funeral preparations and other related busyness to play cards and a new favorite game: Monopoly. That game necessitates quite a long break in activity and the two games played thus far have been fragmented across several days but both ended with Tobin victorious. He seems to have a knack for stacking paper and managing property. Our thoughts and activities over the last two weeks have been focused on saying good-bye to Nana Yardley. 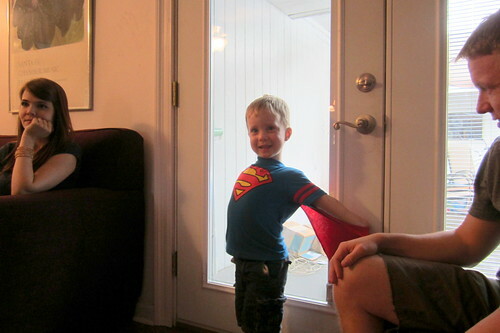 Tobin was three and a half when his Granddad died in November 2009, right here in Grandma's house, so he has some concept of death, but Evan does not. The first few days we were here, Evan wanted to see Nana and asked where she was. We could tell him she was at the hospital at first and even took him to see her, where he saw her "sweeping." After her death, Evan asked again where Nana was and we told him she was in Heaven. Tobin followed up by asking where Heaven was. I told him that I had always thought of it up in the sky. He smiled quizzically at me and observed, "Well, that's kind of weird because we bury her body in the ground." We had a brief discussion about the difference between body and spirit, and I think Tobin let me off easily with my fumbling explanation but I imagine there will be follow-up inquiries in the days and months to come. For Nana's funeral, Grandma, Sarah and Matt collected photos to display. Tobin quickly identified his favorite photo and sweetly asked Grandma if he could have it after the service. Grandma happily obliged. Here's the picture, taken two years ago on our last Epic Road Trip, just a couple months after Nana moved to Kentucky from Missouri. 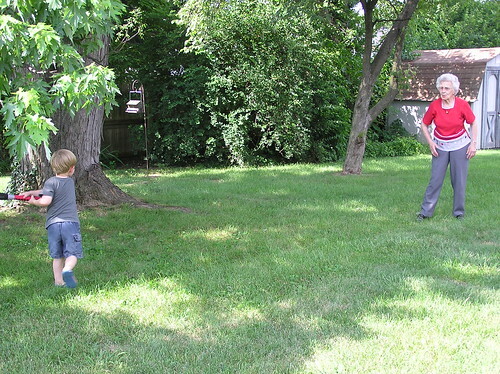 She's eighty-seven at the time and playing baseball in the backyard with Tobin. We are sad that she's gone but thankful for memories of wonderful moments like these that she was able to share with our kids--especially Tobin--in her last few years. 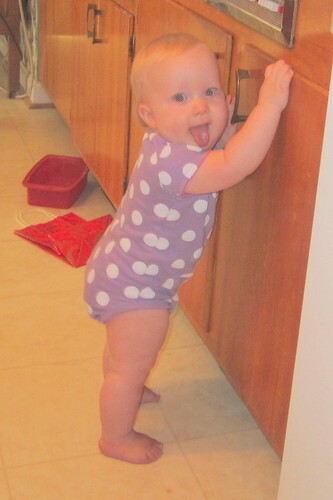 Alas, I am dusting off the laptop to write a little something as Lauren turns 13 months old. A day late. We are well into our fourth week on the road. 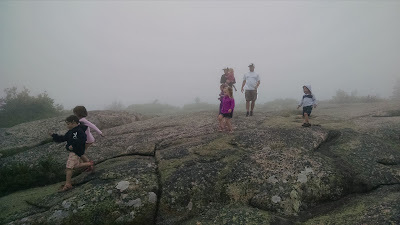 I'll admit I'd hoped to update more along the way but a couple weeks of spotty Internet service, sketchy nighttime sleep by the subject of this post plus many--mostly wonderful--distractions have kept me from doing so. I've opted to spend my daytime hours trying to relax and enjoy doing whatever I want. Apparently, I have not wanted to blog or upload photos to Flickr. I imagine I will get to chronicling our adventures soon enough. Just not today. As for my dear daughter, our traveling, which has taken up the better part of her thirteenth month, has been a mixed bag for her. I suppose I shouldn't be shocked that her nighttime sleep has been so poor (many, many wakings every single night) since traveling can do that to a little one. But on previous vacations, including our trip to Florida at the end of May, she'd done so much better. I hate it for her and, selfishly, for me, as I've gone nearly a month without a decent night's sleep. Of course, during the day, Lauren's been her usual charming self. I think that's what has kept me from calling the whole thing off and heading home. While she's been fairly selective about who she will let carry her around, she's been especially quick to reach for Mimi and Grandma, much to their delight. She's enjoyed swimming, riding in motor boats, playing with babies very close to her own age and crawling around interesting houses and hotels. She waves "hi" and claps and dances and babbles all the while. While she hasn't loved sitting in her car seat on our traveling days, she's done progressively better as we've logged our 3,000-plus miles up to this point. She seems to do best when Mama drives and Daddy sits beside her. I suppose I tend to bring out her more emotional side. But that's exactly as it should be for my baby. Yesterday, as Lauren finished her thirteenth month, she also lost one of her best admirers: Nana Yardley, Matt's maternal grandmother. We were blessed to make our way to Louisville late Saturday night in time to spend a couple days saying our good-byes to Nana. Though she slept most of time during our hospital visit, I like to think she rested peacefully to the sound of the boys playing cars on the couch in her room and Lauren babbling and clapping for the small audience of fellow Nana devotees. Rest in sweet peace, Nana. We love and miss you.